Wow! What can I say about these? Firstly, the photos do them absolutely no justice. There is no way to describe just how lovely these things feel to hold. Their website describes them as being created using the same sophisticated design and modelling techniques employed to produce formula one racing cars and they certainly feel that way. From the moment you pick it up you can feel the quality and work that has gone in to producing these picks. Rather than being outsourced to China, where it would be cheaper, Nic has kept the production local and they are precision moulded from high grade acrylic in the UK. So the first obvious thing is that they have 3 very different shape/sized lobes. 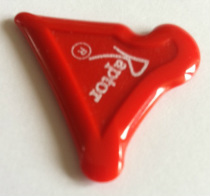 The 'pointy' tip is similar to a traditional pick and gives a sharp attack. The middle more rounded tip gives a richer sound. The widest tip gives a nice fat warm sound especially suitable for jazz. Their website describes them as '3 picks in 1' but I would argue that they are actually '4 picks in 1' as they have a 4th feature which is the notch or dimple. This is good for popping or biting in. (See this video for a demo how to do a pinched harmonic with it). 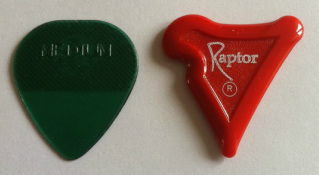 To be honest, as much as I loved the design I didn't think I'd like playing with this pick as it seems so thick compared to my normal medium picks, but it is really easy to play with and produces a fantastic variety of sounds. I like the versatility but I also like the fact that it has given more attack and strength to my notes. I'm definitely enjoying getting used to this pick and exploring the different ways I can play with it. My normal flat pick seems really boring and basic now! 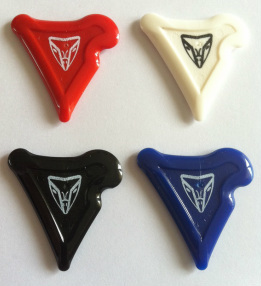 The added bonus is that unlike a lot of specialist picks, these are totally affordable at £2.49 ($4), especially considering that you are really getting 4 picks in 1! 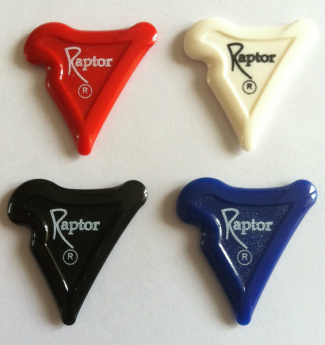 At the moment there are two types of Raptor pick - the original one & the new 'R' series. The original ones were made on a CNC router and each one individually hand finished. This meant that in reality, they cost about £20 to make! They were sold on eBay for only £1.50 each! There were only a few hundred made, to test the market. The difference in finish is amazing! 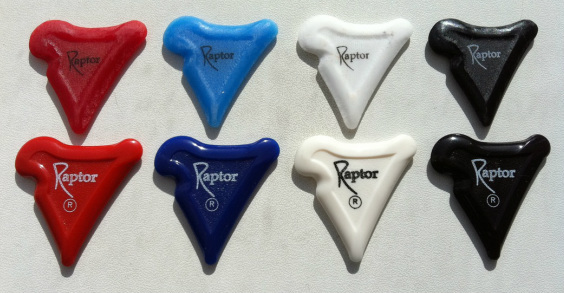 Original hand finished Raptor picks on top. Supersleek, precision molded 'R' series below! 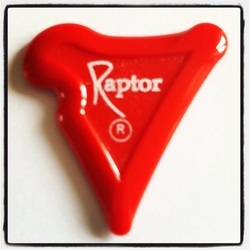 Click on the logo to go to the Raptor website.